We Are Your Ultimate Service Provider in any state, province, city or county across the USA and Canada. Thinking about a pool enclosure that perfectly matches your indoors and outdoors can be overwhelming. It's hard to nail down when the choices are unlimited. Right? 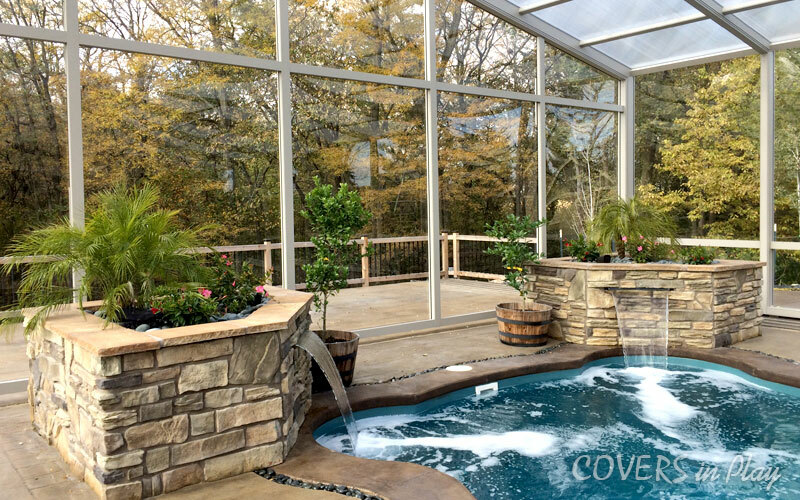 That’s what COVERS in Play offers as it provides an impressive range of custom pool enclosures for homes and commercial applications. Graceful architetcture and style, Covers in Play has the expertise to design and manufacture the pool enclosure of your dreams. COVERS in Play takes immense pride in its state of the art infrastructure to build the world’s most fascinating pool enclosures. Browse through our gallery to get a good look at the depth of our design capabilities. If you have a specific design in mind, let us know. Our experts are available to extend their in-depth knowledge and expertise to meet your peculiar needs. Pool enclosures are becoming a practical reality for a growing number of property owners. Our years of relentless pursuit to better our pool enclosures have made us a sought-after choice across the USA and Canada. Covers In Play is at your service in the least possible time anywhere in the United States and Canada. Read what our customers have to say about their custom pool enclosures. Need some good recommendations? Talk to our experts to know more about our popular choices. Or Fill the form and get a call back. Covers in Play enclosures stand out in style and functionality for years. As the premier choice of customers across the USA, we source the finest quality material and components to add more style and strength to seamlessly withstand hurricane winds, the heaviest rain and snow and even heat. Be assured that our pool enclosures have a lifespan stretching beyond a decade without deterioration of its aesthetic beauty - 20 year warranty. Beautify the interiors or uplift the outdoors with our pool enclosures, purposely designed and built to match your specific needs and preferences. Every pool owner wants their enclosure to last for decades. However, some enclosures just don't make it. Age, weathering, materials used - it may need some TLC. Timely repair and regular maintenance help you fix most of the issues before they get worse. Our skilled and experienced installers have the knack of effortlessly managing every minor repair to complete replacement. Share your specifications - size and design to let our designers to begin working on your pool enclosures. Whether a residence or commercial installation, give us a call to see what solutions are possible. Share your details and our experts will respond within 3-4 business hours. Be assured of a call back as we believe in sustainable services to our valuable clients.